- Peel the raw bananas and wash them properly to get them clean. - Pat dry with a kitchen towel and apply turmeric powder lightly over them. Keep aside for 5 mins. - Cut them into thin (your preference on thickness) slices. 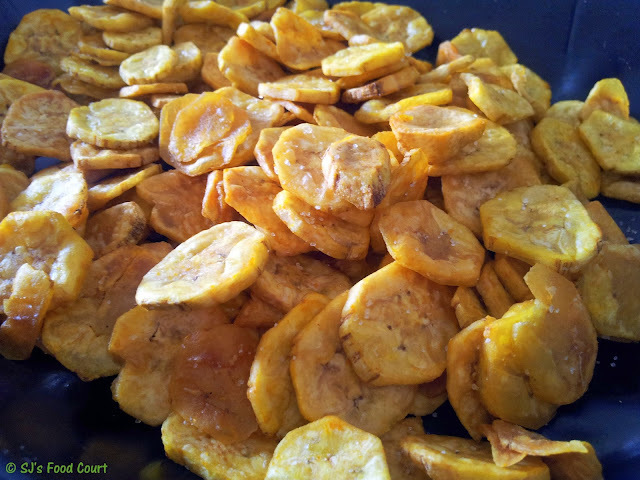 - Heat oil in a frying pan and slide the slices of 1 banana at time. Keep stirring it in between. - Deep fry till they are crisp in texture... You'll hear the crispiness while stirring. - Take them out to crumpled absorbent paper. Sprinkle salt when hot! - Once cooled down to room temp, store them in airtight container!!! I cud munch on these anytime!!! Making of these chips is a event in my native place.Its still done there on firewood and family members gather around and help our mummies in making them and eating the freshly prepared hot-hot chips. You can also sprinkle a mixture of cumin powder,chaat masala chilly powder and salt after the chips are fried, for that extra masaledar taste.